Jieming Tang, age 17, came to the United States from China in 2010. He is currently a student in the Young Artist Program at the Cleveland Institute of Music, where he studies violin with Jaime Laredo and chamber music with Joel Smirnoff. His former teacher at CIM was Paul Kantor, with whom he studied violin from 2010 to 2012. Tang has been a member of the Cleveland Orchestra Youth Orchestra since 2012, where he was recently appointed as concertmaster. He is also a Junior at Saint Ignatius High School in Cleveland. 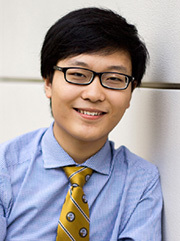 Tang is the fifth prize winner of the 2013 Cooper International Violin Competition. In 2012, he received the Jack Kent Cooke Young Artist Award, and appeared on NPR’s From the Top. In late 2012, Tang recorded and sold 1,000 copies of his CD album – Jieming Tang Presents Violin Classics, for St. Colman Church’s capital campaign in Cleveland. He has actively performed in more than one hundred events since he came to the United States, including performance at Cleveland Orchestra concert in Severance Hall, and touring performances with BlueWater Chamber Orchestra as a featured violinist. Tang began his violin studies with Tian Feng since age three in his hometown Hefei, China. At age eight, he went to Beijing to study with Zhao Wei at the pre-college division of the Central Conservatory of Music. Before he came to the United States, he had been honored at many national competitions in China, including first place at the 2007 Golden Beijing National Young Artist Violin Competition, second place at the 2006 Close to Mozart National Violin Competition, and fourth place at the 9th National Violin Competition in 2009.